Discover How to Turn Players’ Parents into Your Biggest Allies – Creating a Positive, Encouraging Atmosphere in Which Your Players… & Team… Will Thrive! Parents – they can be a coach’s biggest allies or they can undermine your authority, cause you to second-guess your coaching decisions and, if they are really bad, even cause you to question why you decided to get into coaching in the first place. Here’s the truth – many coaches who are not careful find themselves spending more time responding to parent complaints than actually coaching! This report reveals everything you need to know to ensure good communication with parents – and it even includes a parent and coach code of conduct that will ensure everyone understands what is expected of them. Exactly what you can do to encourage good behavior (both in players and parents) and set a positive tone for the entire season! How to ensure each parent understands your practice and game schedule, your experience and coaching style, your expectations for the athletes and for parent involvement so there are no misunderstandings during the season! 12 steps to holding an initial team meeting that will get parents on your side and keep them there for the entire season no matter what level you coach – elementary, middle school, youth league, high school, even college! How to communicate with parents in a way that will naturally draw them in and make them supporters of your program – including how to deal with those parents who are hard to reach! The ONE THING you must do if you really want to gain parents’ support – do this and you’ll be amazed at how positively parents respond! How to eliminate conflicts with parents BEFORE they occur! How to handle game day communication so that your focus remains where it should be – on your players! 7 often over-looked keys you should focus on when trying to select an assistant coach – follow these tips and you are sure to find someone who will lighten your load and free you up to work with small groups or even one-on-one with players when necessary! How to be a successful “Parent-Coach” who is capable of removing the “parent” hat and putting on the “coach” hat during practice and games! How to deal with the four most common types of “problem parents” – you’ll be amazed at how easy it is to do when you follow these simple tips! How to admit when you are wrong – this is one of the most difficult things to do but just because you have taken on the responsibility of being a coach does not mean you are going to be perfect … find out here how to apologize, admit you were wrong and get parents and players to like you even more! It’s Time You Discovered How to Get Parents on Your Side! The National Council of Youth Sports reports that almost 40 million American children and teens play competitive sports these days – and many of their parents are right there beside them, attending practices and games, providing transportation to events and providing the funds for the many athletic programs. As a coach, you will naturally want to build strong relationships with your players. At the same time, though, you cannot succeed in that regard without the support of the parents. You’ve probably heard or read many horror stories about parents who have exhibited volatile and rude behavior at their child’s sporting event. Luckily there are a number of things that you can do to prevent many of the negative, explosive situations you might encounter as a coach and we’ve taken care to outline them in this special report. When you combine a great sport with a caring, trained coach and encouraging, loving parents, you’ll get an unbeatable combination for kids! This report will show you how to establish a clear line of communication between yourself and the parents so that future problems can be avoided! Order Now & Get This Special Report at a Special Low Price! This report would normally sell for $14 in its offline "physical" format. But I’ve been able to cut the cost by offering it as downloadable report directly accessible from the Internet. This way I have no inventory and no fulfillment costs. I also don't need to pay anyone to take orders over the phone. As a result, I can pass along my cost savings to you – which means you win and I win. So today, you can get instant access to the Partnering With Parents Report for just $7! Bonus #1: Coach’s and Parents’ Code of Conduct – Having set guidelines encourages good behavior! Bonus # 2: Pre-Season Athlete-Parent-Coach Agreement – Now everyone will know exactly what’s expected of them during the season! Bonus #3: Post-Season Parent Assessment Form – Find out from others’ perspective what parts of y our program are working and what needs improvement! Bonus #4: Parent Orientation Checklist – Ensure your orientation meeting goes perfectly with this itemized checklist! If you are not completely satisfied with your purchase, simply notify us within 60 days and we will refund your money, in full, with absolutely no questions asked! YES, I want in! 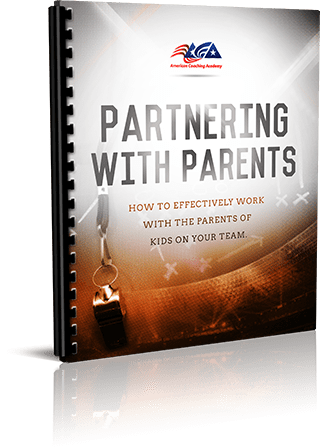 I want access to Partnering With Parents: How to Effectively Work With the Parents of Kids on Your Team! Please give me INSTANT access to this comprehensive, easy-to-follow report right now! Your Partnering with Parents Report is waiting for you to claim it. Just $7 gets you instant digital access so you can start building great relationships with the parents of your team today! You can print the report out as a hard copy, or download it to your smartphone, tablet or eReader device and bring it right to practice!